There is nothing better than your favorite meat, seasoned and cooked to perfection. But you have to have something equally as good to go with it. This potato casserole is amazing and goes perfectly with beef seasoned with our Gourmet Beef Seasoning. Boil potatoes with bay leaf and salt until tender. You will know when they are done when you can stick a fork in them with a slight amount of resistance. Once done, remove the potatoes and allow to cool. Preheat over to 350F. In a medium sauce pan, melt the butter and add the cream of chicken soup. Stir until smooth. Blend in sour cream, pepper, onions and 2 cups of the cheese leaving the rest for later. Spoon potato mixture into a buttered casserole dish and bake at 350F for 30 minutes. 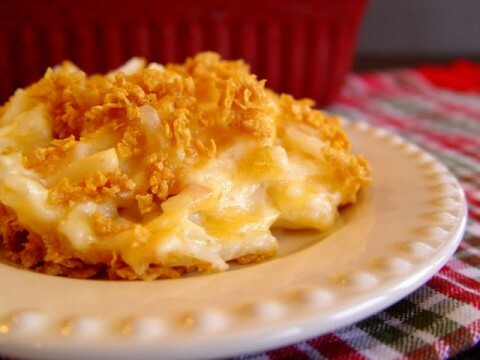 Combine the rest of the cheese and the corn flakes and sprinkle them over the cooked casserole. Bake for another 10-15 minutes until cheese on top is melted and slightly browned. This recipe is a definite crowd pleaser! Just remember, it goes quick so be sure you make more than you think you will need.